Academy Award winner Anthony Hopkins receives the Virginia Film Festival Award in Charlottesville. 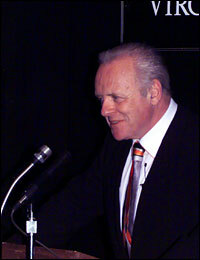 Sir Anthony Hopkins thanks the audience Saturday after receiving the Virginia Film Festival Award. CHARLOTTESVILLE-- For an Academy Award winner, a knight in the Queen's Royal Army, and one of today's most respected actors, Sir Anthony Hopkins is amazingly low-key. One of Hopkins' favorite things about being an actor isn't the fame and glory: "I get to meet real movie stars," he says. Take for instance his delight at the Academy Awards one year when a fellow actor – and fan – introduced himself. "This man came up to me and said, 'Hi, my name is Harrison Ford.' I said, 'I know,'" the soft-spoken actor recalls with a laugh. Hopkins -- who's no stranger to Richmond, having filmed most of "The Silence of the Lambs" sequel, "Hannibal," here and having recently returned to start filming Stephen King's "Hearts in Atlantis" – graced the University of Virginia Saturday as recipient of the 2000 Virginia Film Festival Award. "I didn't think I was coming back to Virginia [after 'Hannibal']," Hopkins said while accepting the award. But the director of "Atlantis" came to meet with Hopkins in Richmond while he was filming "Hannibal," Hopkins explained, and "they decided they wanted to film here in Richmond and Charlottesville." Gayle Vail, president and CEO of the Virginia Tourism Corp., took special delight in introducing Sir Anthony. Anthony Hopkins discussed his most famous characters, from Hannibal to Nixon, Saturday at the Virginia Film Festival in Charlottesville. "The precise whereabouts in this state where Mr. Hopkins has been have not been disclosed," Vail says. "[But] Hopkins and his characters seem to be drawn to Virginia and we couldn't be happier. ... We're delighted Virginia will get so much exposure as a great place to make movies." She adds, "Hopkins and Virginia seem to have a lot in common. They're both graceful, charming, a little mysterious and extremely attractive." Indeed, Hopkins seems to be in an elite group with the likes of Sean Connery and Harrison Ford – they just get better with age. Hopkins was greeted with a heartfelt standing ovation as he took the stage Saturday night. The crowd was obviously there to see him as well as to watch two of his movies that were screened at the festival, 1991's "The Silence of the Lambs," and last year's "Titus." Corey Sullivan flew down from New York to visit his brother Ryan, a junior at U.Va., but the timing of the trip was no coincidence. "It completely revolves around [Hopkins]," Corey says. "He has an incredible presence, he’s very powerful. I’ve idolized him for an incredibly long time. He’s the most brilliant actor alive right now. He’s just an incredible person, too. You hear everyone talking about what a fun guy he is." Ryan adds that Hopkins' quiet dignity also commands respect: "He has the grace and presence you see in his movies." That intense presence surrounds Hopkins regardless of whether the cameras are rolling. Perhaps Roger Ebert sums it up best. The noted film critic moderated a discussion with Hopkins after the award presentation Saturday night. Sir Anthony Hopkins discusses his film career with Roger Ebert. "No one has done a better job than you have of inhabiting different people," Ebert said. "You just disappear into a character and occupy it with total confidence. It's not just an impersonation, it’s an embodiment." Yet in real life, Hopkins is the quintessential gentleman, even pausing to pour some water for Ebert before serving himself. Lili Grabbi, a freshman at U.Va., says she was pleased to see that Hopkins isn’t one of those actors who's too full of himself. "I loved him," she says. "He was very personable, very humble, very friendly, which is always good for a star like him. He made a good impression." One thing that makes Hopkins so accessible to the public is that he doesn’t hesitate to laugh at himself. "When I was in school, as a child, I was very desperately stupid," he says. "I was socially inept. I went into myself and became a very good mimic. That became part of my repertoire, my armor, I suppose." And in spite of his awards and acknowledgments, Hopkins tries to keep his livelihood in perspective. "I get a little tired when people around me take it very intensely," he says. "It's entertainment. I try to take it seriously enough to do my own job. ... It's not my life, it's a job. Acting is what I do. "I get up in the morning, they call me to the set and I do my job. I don’t like any fuss."